This make-ahead Carolina kale salad recipe is my favorite lunch item right now! Just like brunch, kale is one of those things I can't get enough of. Kale is a superfood and one of THE most nutritious things you can eat. You can incorporate it into your daily meals by doing a tiny amount of meal prep and have a nutritious kale salad every day for the week ahead. Only 5-ingredients and minutes to prep. This salad is low calorie with high impact on the nutrition value. 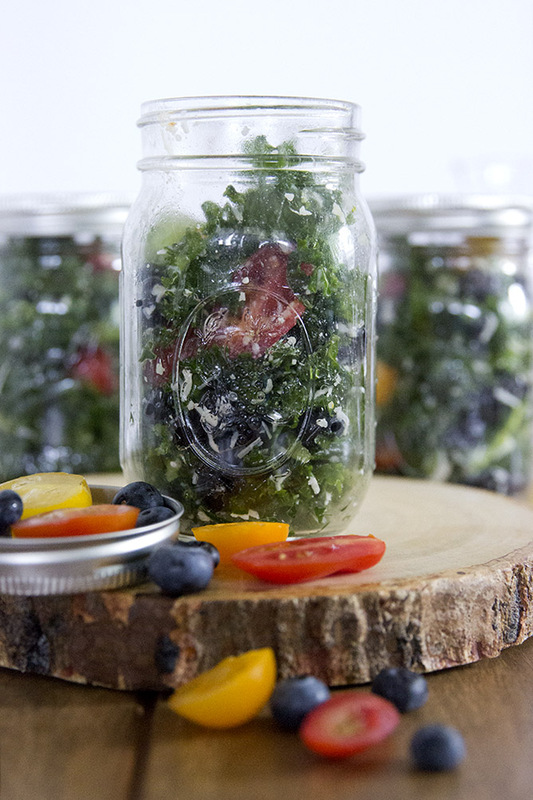 Stored in environment friendly (and Pinterest-approved) mason jars, this salad recipe is all kinds of a WIN! Yes, kale is a trendy green vegetable all over your Instagram feed right now, but it's been around much longer than the recent hype... and trust me, it's earned the street cred out there amongst all the other veggies. It's worth Googling to read about all the vitamins & minerals packed into each leaf. It may help you understand why I hope the kale trend never goes away. Kale is also relatively easy to grow, as I'm learning. If you didn't catch our announcement, John and I just moved homes and lives to Durham, NC. Since we're moving from a condo to a house with a yard, I've been reading up on veggies that are good starters for gardening newbies. I read that kale is easy to grow and care for, so I'm really hoping to add it into my future garden (fingers crossed!). I created this recipe after I was inspired by my Western North Carolina Farm Tour with fellow NC food bloggers. You can read all about my day 1 experience on a water buffalo farm here! On our second and third days of the tour, we visited New Sprout Organics headquarters and a few local farms. We talked about how they grew kale and the different varieties they harvested. We even got to harvest some small tomatoes ourselves at one of the Harvest Farm locations in Marion, NC! It was actually quiet challenging to try and harvest the beautiful tomatoes without dropping them. With my combined experiences and tastes of the wonderful local produce & cheese, I knew I wanted to put together a recipe that highlighted the quality of the ingredients, not load them down with other flavors. That's why I decided to keep the ingredients simple, but use a few prepping techniques that would really bring all the flavors to life. I'm also excited to share that I'm delving into the world of food video! Instead of sharing instructions step by step with photos in this post, I've decided to put it all together in a video that's under a minute. Check it out & let me know what you think! The instructions are also listed on the full recipe card below. Are you as into kale as me? Do you do meal-prep salads for the week? Here's to make-ahead salads in mason jars... Cheers!